I have had a soufflé on my to bake list for some time now. I am not sure exactly why it has been on my list, but maybe it is because a soufflé sounds elegant and not so easy to make. Plus the fact that I have never eaten one, I just wanted to see what they were all about. 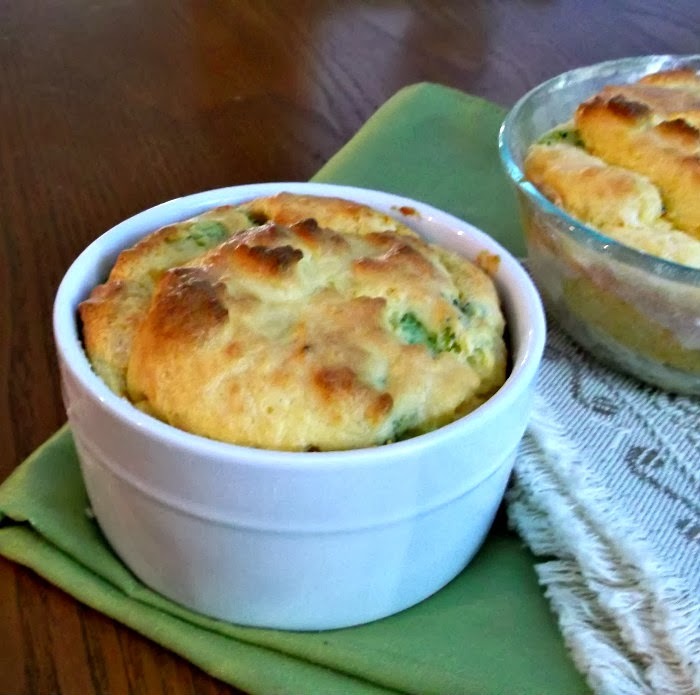 I found a basic recipe for a soufflé to go with , but added a vegetable to the mix. It turned out better than what I thought it would. The eggs were light and fluffy; a total different texture than a scrambled egg would have been. It may have taken a little more time than scrambled eggs would have taken me, but I think it was well worth my time. It may just be the beginning of my soufflé making. 3. Prepare your basic roux (melt butter in a pan; add flour and cook whisking constantly – until it just begins to turn a light brown color. 4. Heat the milk in the microwave until hot, but not boiling. 5. Add a small amount of the roux into the milk and mix and then add the milk mixture back into the roux. 6. Reduce heat and whisk a small amount of this hot sauce mixture into the egg yolks, then add the yolks back into the sauce, whisking well. 7. Slowly add cheese and mix until it is melted into the sauce. Add cooked broccoli and mix well. 8. Now use a mixer at medium or high speed to beat the egg whites with the cream of tartar until they are stiff but not dry. 10. Fold the sauce into the egg whites. FOLD does not mean mix. This is important: you will barely mix the two together. It is perfectly okay that you see bits of the white. 11. Place the mixture into the baking dishes and bake for 25 to 30 minutes. 12. Serve, immediately. When soufflés cool, they begin to collapse. Don’t worry; it’s perfectly normal for this to happen. So serve right away and enjoy! 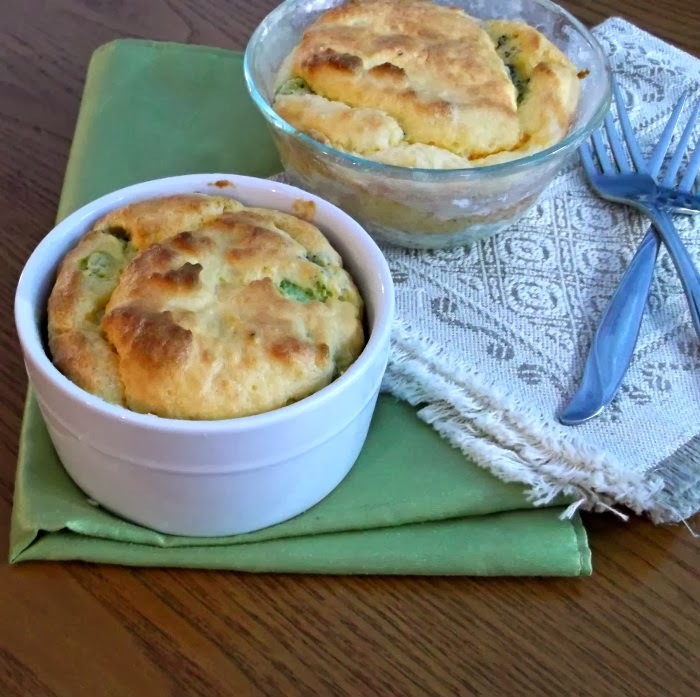 I’ve yet to attempt a souffle either, but it’s on my bucket list! I love your brocc and cheese flavor combo!! Your picture is beautiful. How can I not give it a try after seeing that? Your souffles rose perfectly. I only tried making one once (eggplant) and it was a total fail. These look delicious though and I should try again! This looks perfecto! 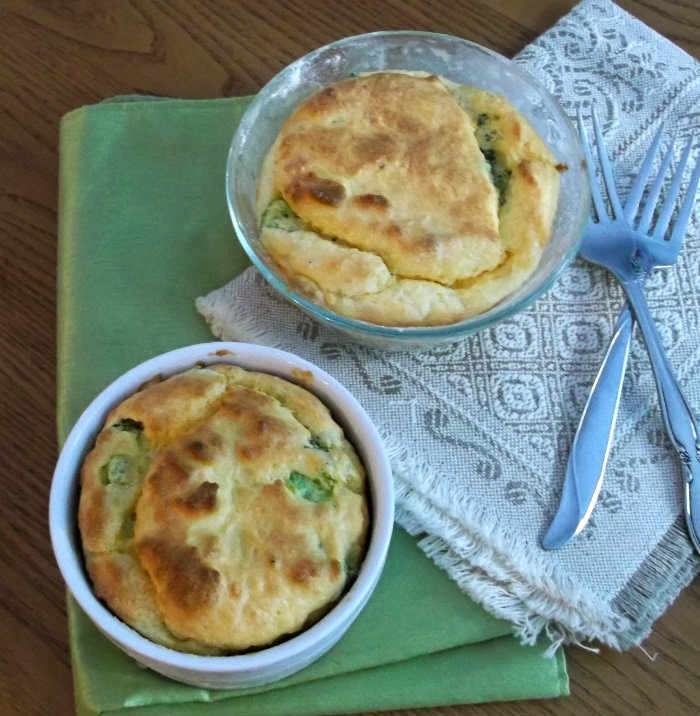 Really great idea for a souffle. I’ve made plenty of cheese ones, but never thought to include broccoli. But you know I will! Thanks.